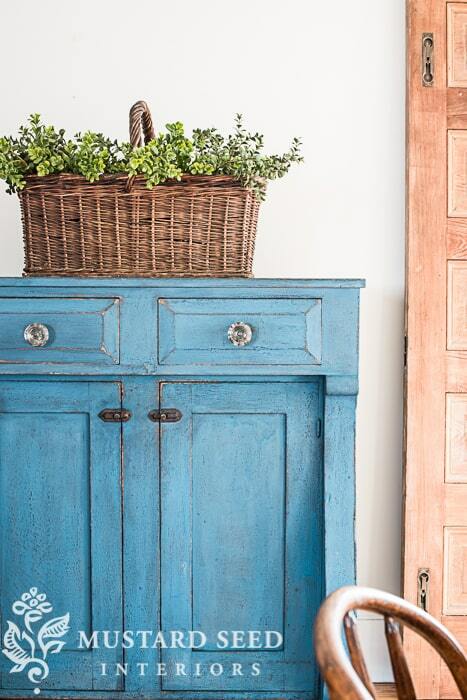 The first time I saw Miss Mustard Seed’s Milk Paint colors layered one on top of the other, I was in love. The piece that inspired me was this jelly cupboard. 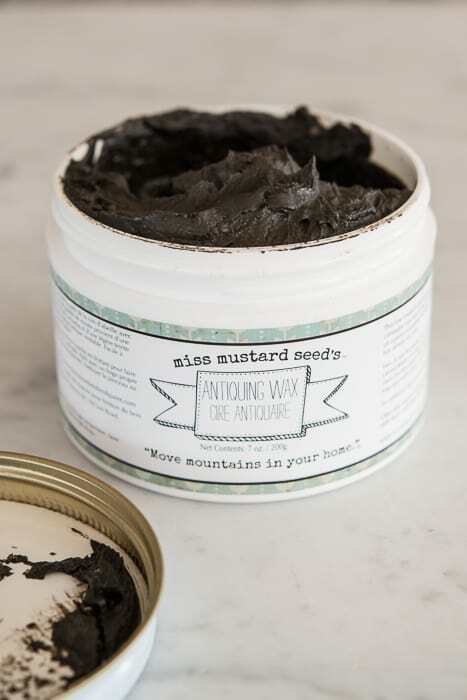 Miss Mustard Seed painted it by layering Flow Blue over Artissimo with a Wax Puck resist in between. 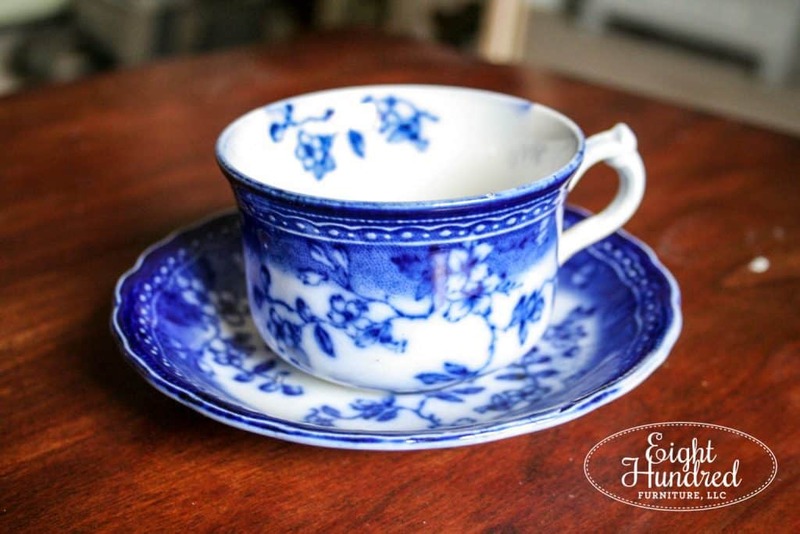 She finished it with Antiquing Wax, and thought it was such a beautiful finish! I tucked this inspiration piece away in the back of my mind until I had the perfect project that could appropriately sport this layered look. I’m happy to report that the time has finally come in the form of an antique empire dresser. 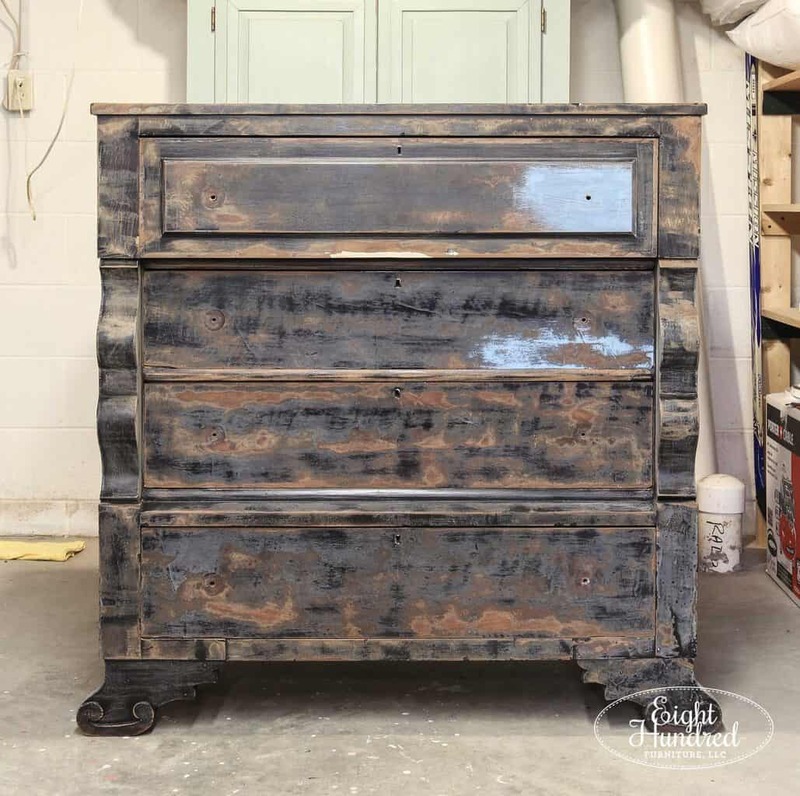 This antique empire dresser caught my attention immediately when it saw it. I loved the lines and it wasn’t too ornate. Sometimes empire pieces can be so big and boxy, but this one was just right. It had an oil-based finish on it (or at least I think it was oil-based) and it was a little rough. There were a lot of drip marks and even some paint brush bristles that were dried in the finish. It smelled like it had been freshly applied (because oil-based finishes can have an odor to them until they’re totally dry and cured). I bought it and let it hang out in my basement workshop for a bit. I knew I would need to sand the existing finish down pretty well before I painted it, and I simply didn’t have the time to dedicate to it for a little bit. 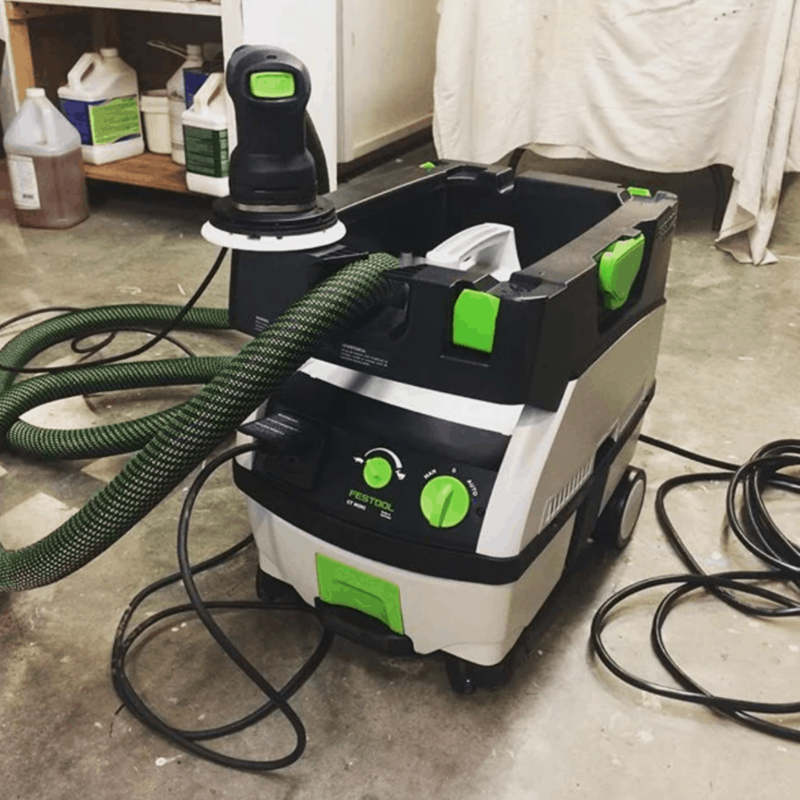 Once my schedule opened up a little bit, I broke out my Festool sander and dust extractor and had a field day tearing up the existing finish. 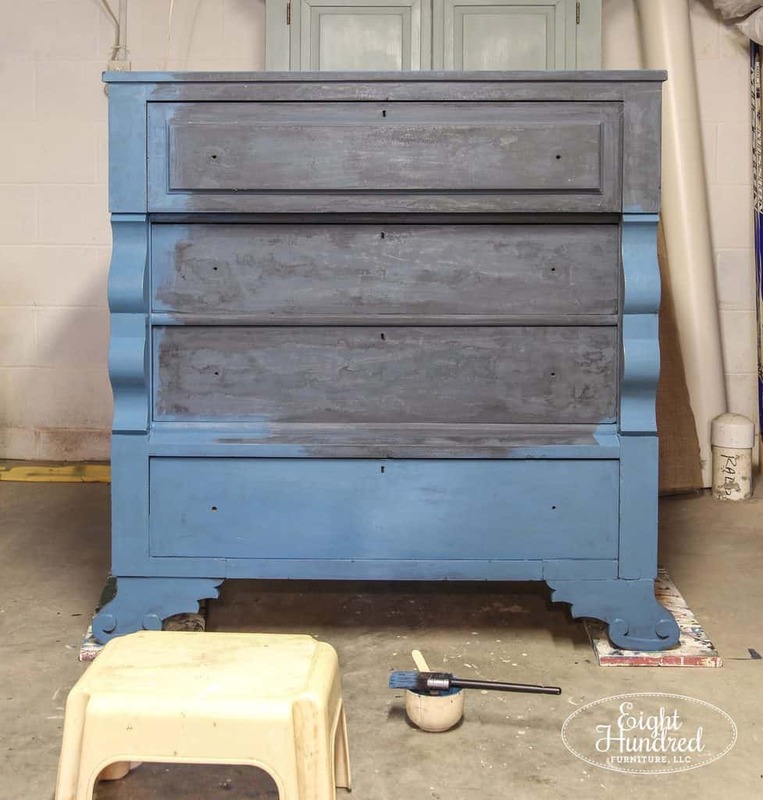 Now you don’t have to sand down a surface as much as I did on this empire dresser if you plan to use Miss Mustard Seed’s Milk Paint. Just a quick scuffing will do. 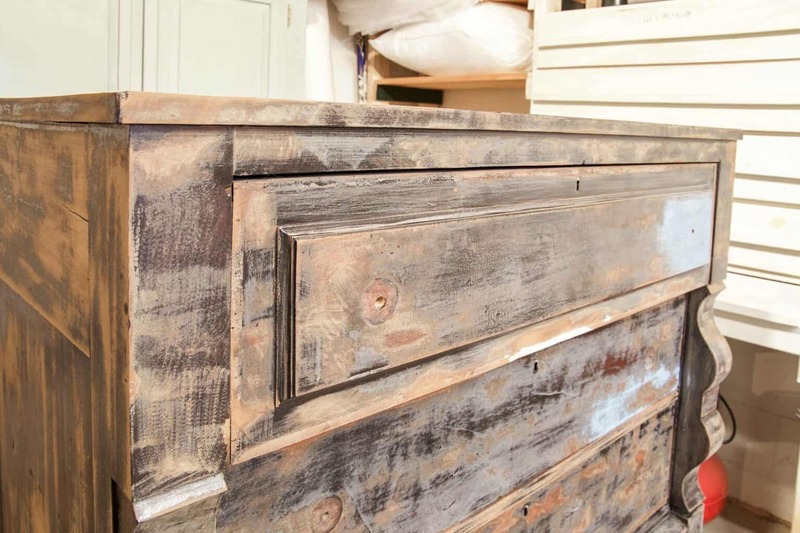 The reason why I sanded this dresser down so much was to remove the flaws in the existing finish. I didn’t want those drip marks and caked-on bristles to show up in my new finish. And so, I attacked it mercilessly with the sander. I got some swirl marks on the surface and it was pretty patchy when I was finished. That didn’t bother me though. It was well on its way to looking fabulous again! The layering process began by painting on a base coat of Artissimo. 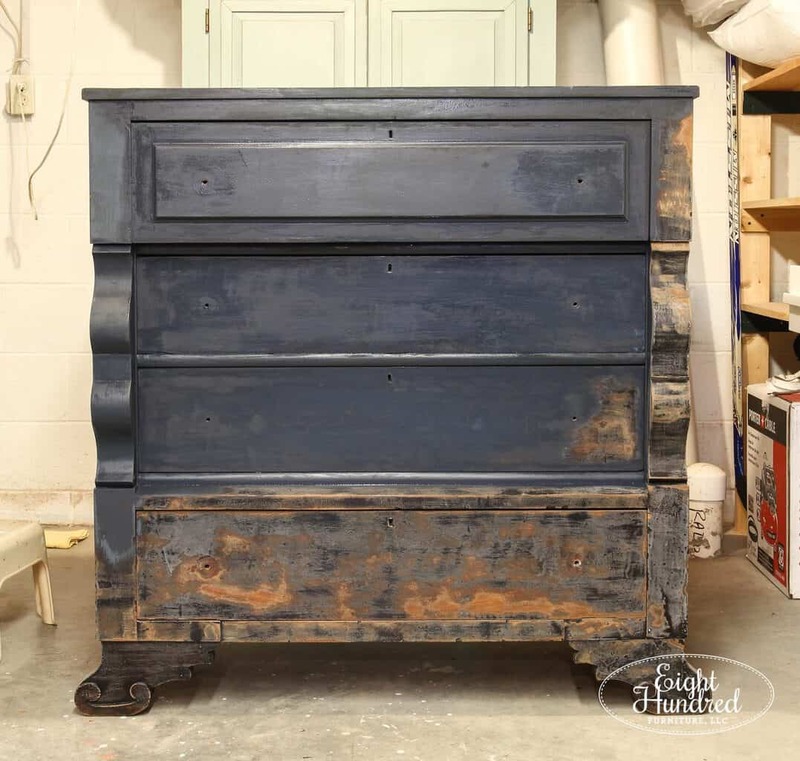 This lovely midnight blue was the base color that Miss Mustard Seed used on her jelly cupboard, so that’s where I was going to start too! I painted one coat on and let it dry thoroughly – about an hour. After the base layer of Artissimo was dry, I rubbed a Wax Puck all over the surface. This is what Wax Pucks look like when they’re fresh. 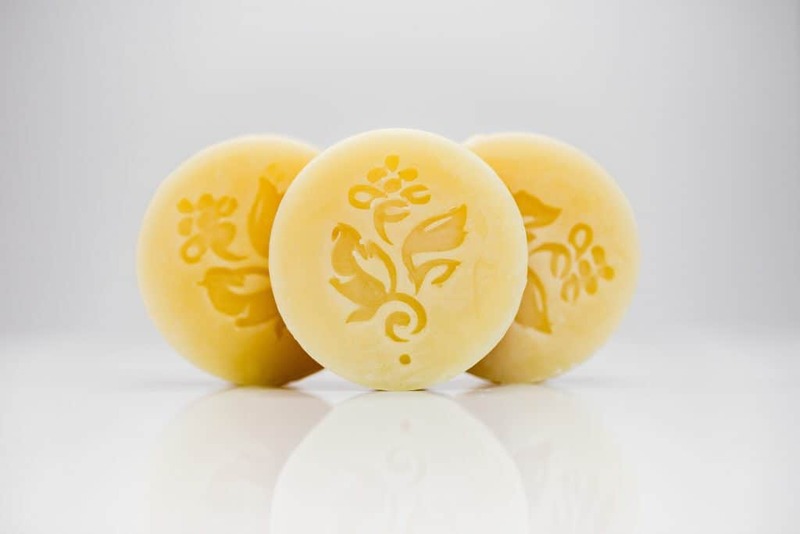 They’re discs of 100% pure beeswax and are super handy little items to have in your workshop. 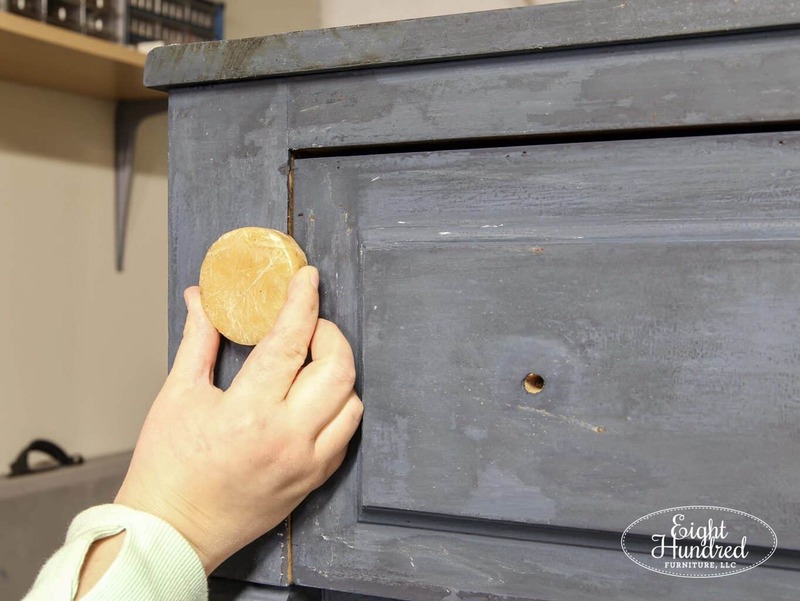 Wax Pucks can be rubbed on the runners of stubborn drawers to help them slide in and out more easily. 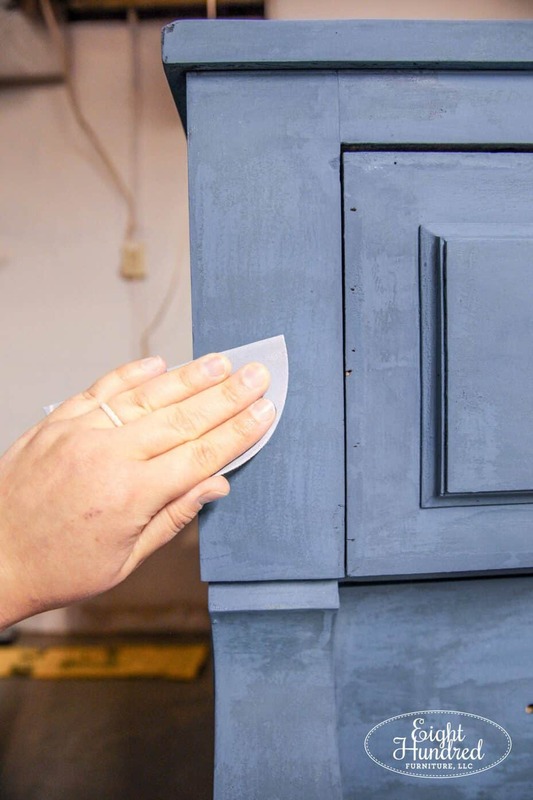 You can rub them along the edges of furniture, paint and then distress the areas where you waxed. This makes it easier to rub paint away. That’s kind of what I was doing at this stage. I rubbed my Wax Puck (which isn’t as pretty as the fresh ones pictured above) everywhere on the dresser. I hit the edges and all of the flat surfaces I could reach. The reason why I did this will become clear in a minute! 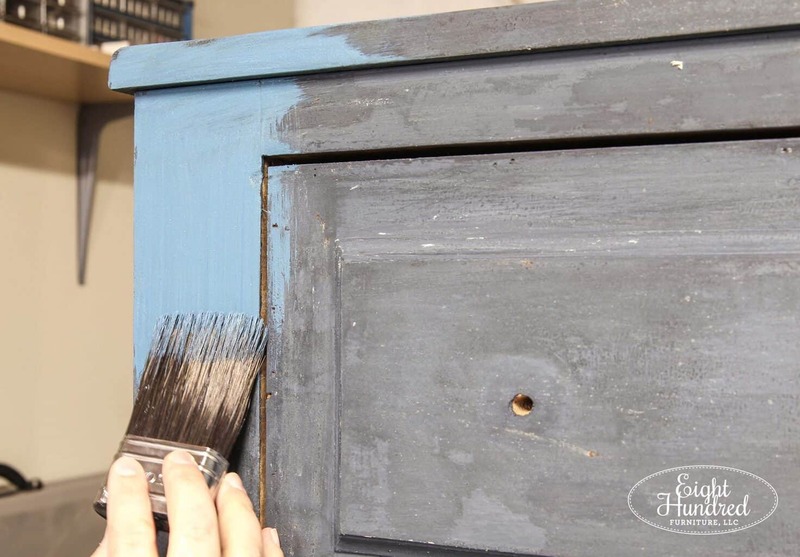 After the empire dresser was waxed, I mixed up a batch of Flow Blue Milk Paint. 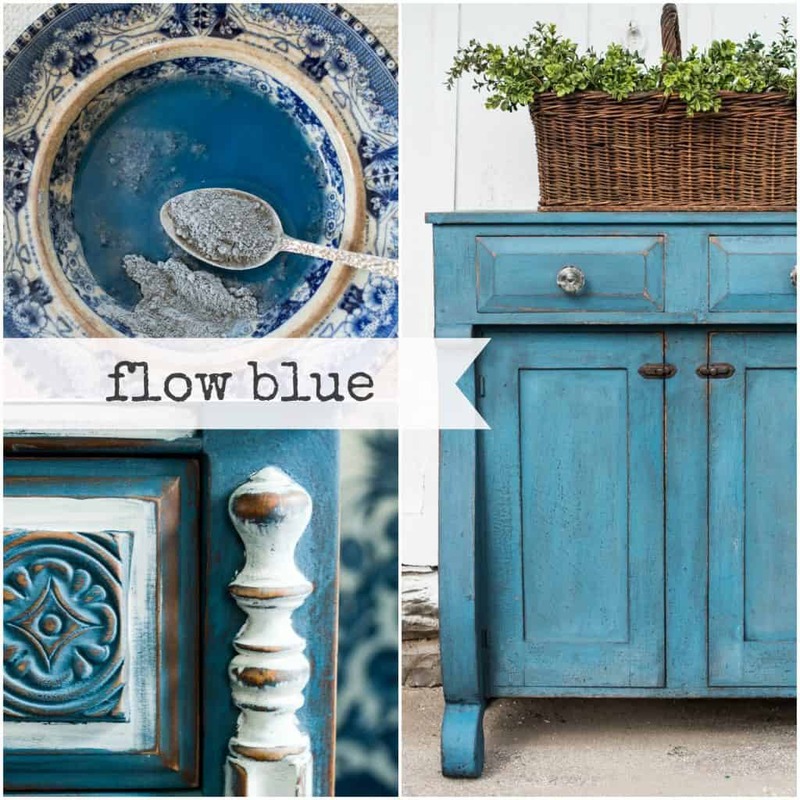 This vibrant shade of blue was inspired by the color you see on Flow Blue china – a favorite of Miss Mustard Seed! Here are some pieces I picked up in my travels. 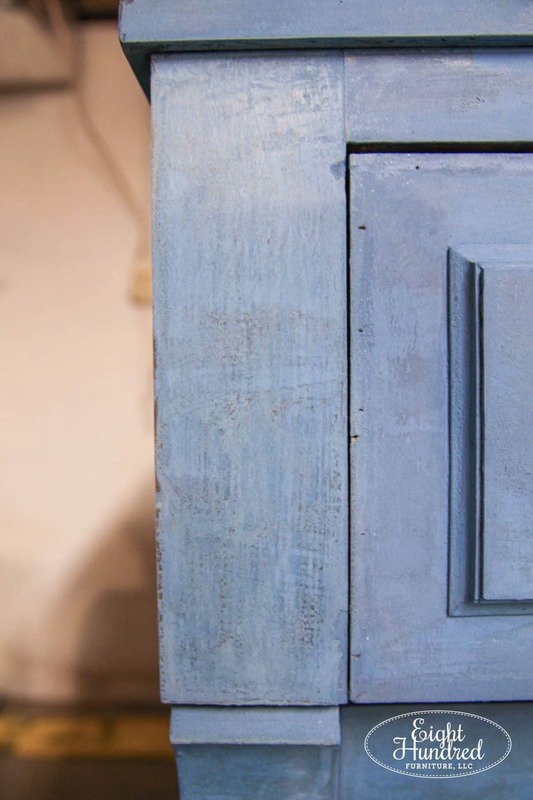 I painted the Flow Blue Milk Paint right over the wax and Artissimo Milk Paint. Because I had such a large area to cover, I used my largest ClingOn! 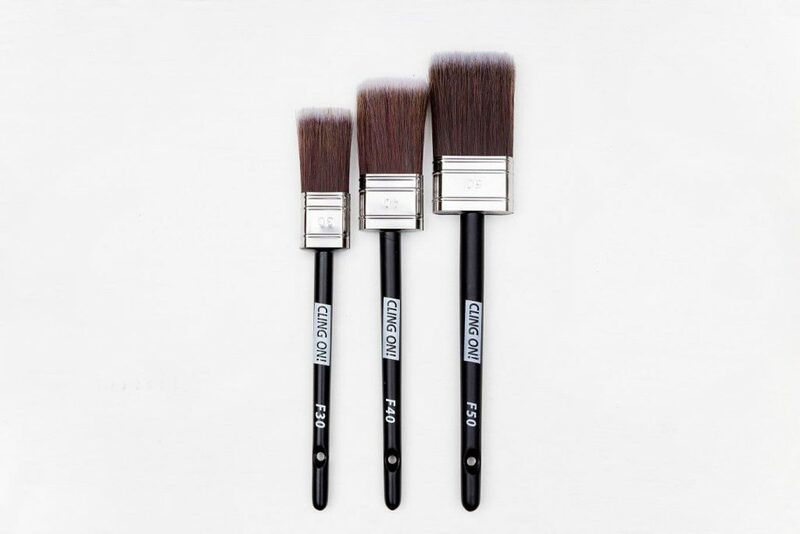 brush – an F50. The Flow Blue looked so lovely and vibrant up against the dark richness of Artissimo. 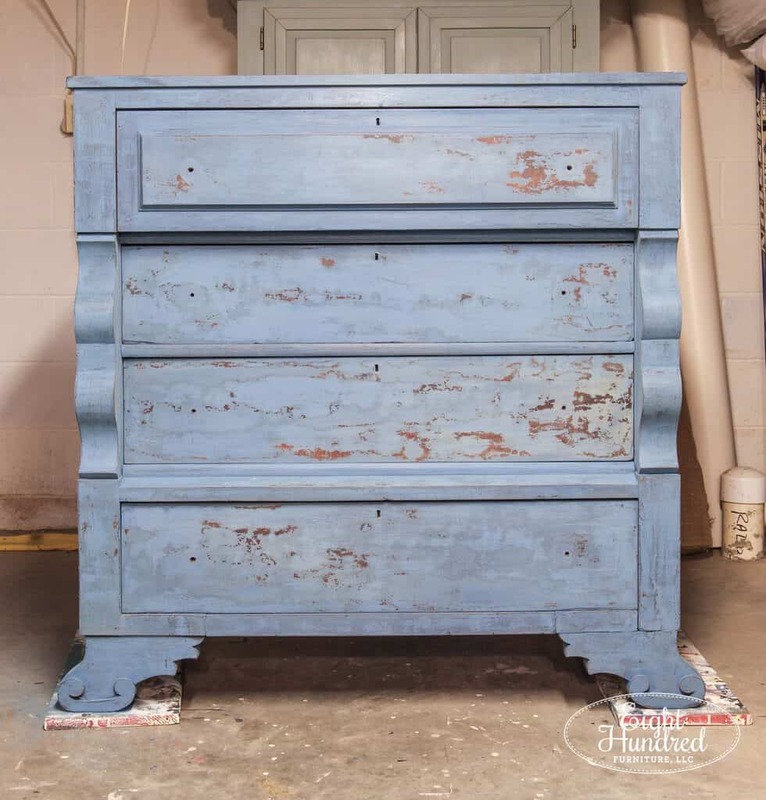 I covered the entire dresser with a coat of Flow Blue and let it dry completely. Now we’re at the step where that Wax Puck layer will make sense! Once all of the paint was dry, I started the distressing process using several grits of sandpaper. I started with a gentle 220 grit to smooth everything out. Once things were smooth, I went back with more aggressive grits like 150 and 120 to rub the edges away and reveal the layer of Artissimo under the Flow Blue. Can you see the darker blue peeking through in some spots? That’s what the Wax Puck did! It protected the Artissimo color so that when I sanded the Flow Blue off, you would see the Artissimo instead of bare wood. I went harder around the edges and laid into spots where there was natural chipping. 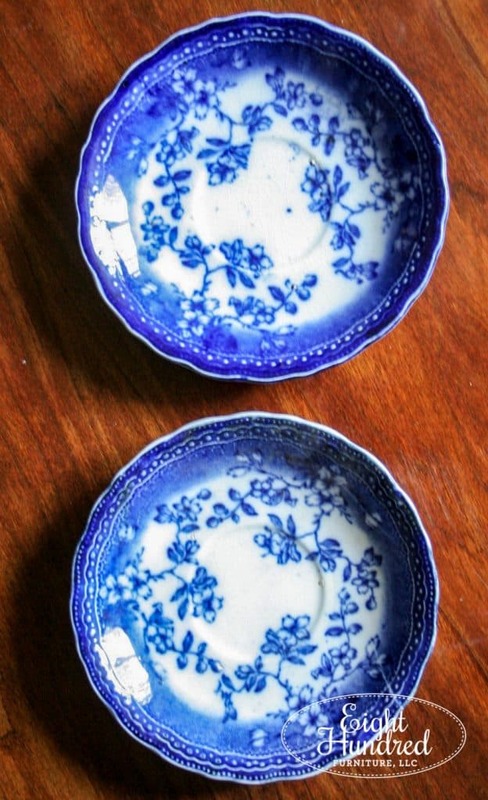 I want this piece to look authentically old like the jelly cupboard that inspired me. Having patches of chipping are more than welcome! This is what the dresser currently looks like in my workshop. 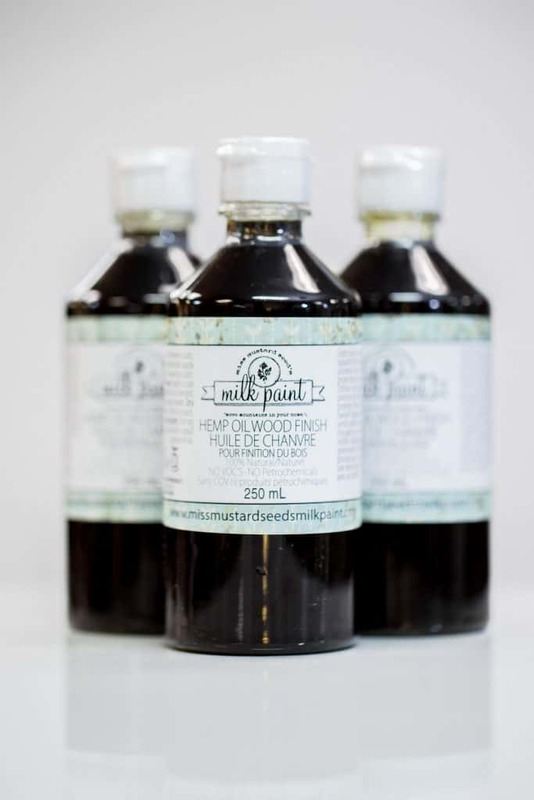 Hemp Oil makes rich colors like Artissimo, Flow Blue, Tricycle, Boxwood and Typewriter look absolutely amazing. It eliminates that “ashey” look and hydrates it like a million bucks! After the Hemp Oil is somewhat dry, I’ll go over it with Antiquing Wax to add some age. But that’s a project for another day. Stay tuned as this piece comes together! 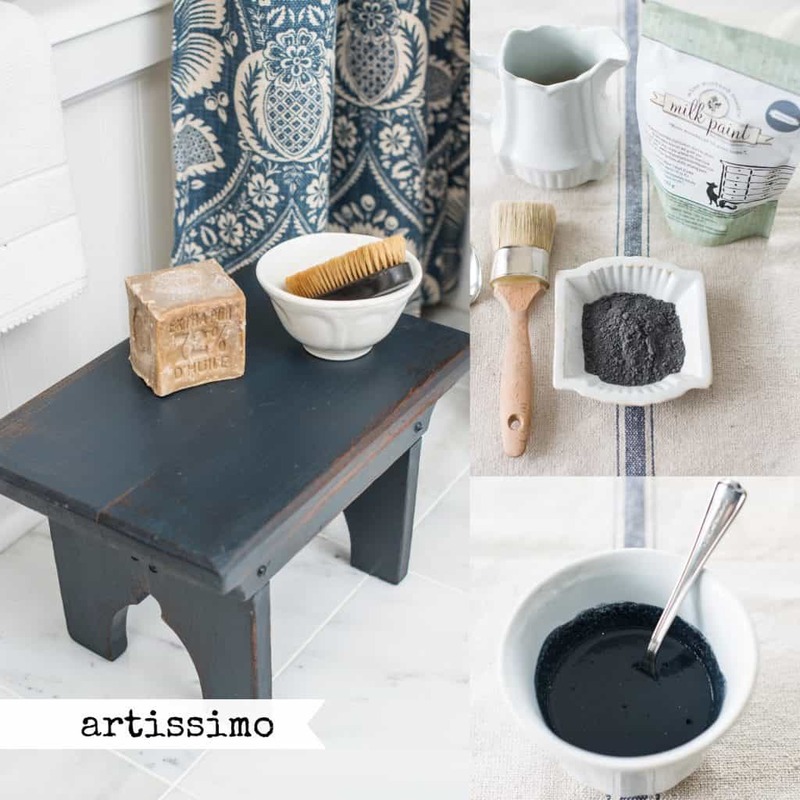 If you want to replicate this look, you can shop for all of the products I’m using from my MMS Milk Paint display at Morgantown Market and Homestead Studios. You can also pick up a ClingOnhttps://www.eighthundredfurniture.com/locations/! brush while you’re there too! Don’t live near me? That’s okay! I’m happy to ship. Simply send me an email with your shopping list and I can take care of you. 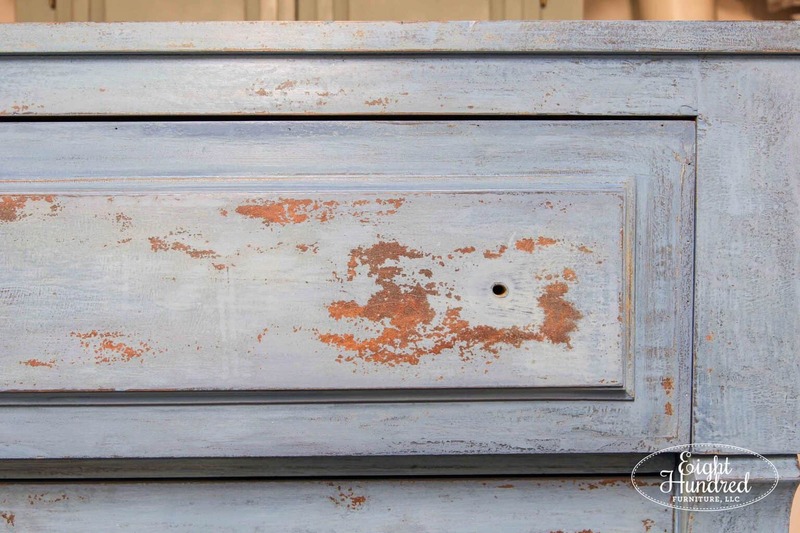 I just love this piece and can’t wait to see the final paint color & the hardware that you choose! I was in your shop in Morgantown this weekend and everything looks beautiful! Hope to see you sometime soon this Spring! Thank you for visiting, Sharon! Are you local or out of town?